Robot-assisted surgery gives you a minimally invasive alternative to open surgery. Instead of one large incision, your surgeon will operate through a few tiny incisions—allowing for faster recovery with less pain, scarring and blood loss than regular surgery. Robotic surgery may also be an option if you’re not a candidate for traditional surgery. Your surgeon also manipulates delicate tools to access hard-to-reach areas of your body more easily while improving hand and wrist motion. These robotic instruments provide a range of motion and level of precision that the human hand cannot. 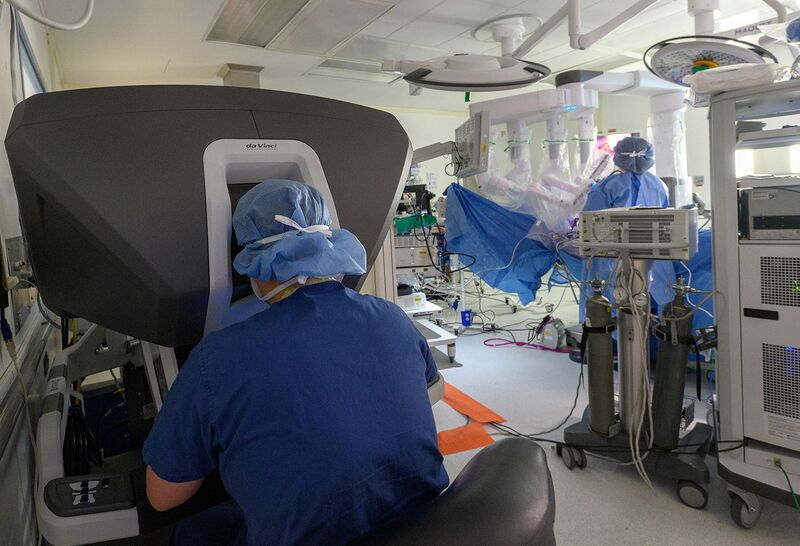 Sitting at the main console of the da Vinci robotic surgery platform, your surgeon sees vital anatomical structures magnified to six times their normal size, with 3D high definition clarity. This enhanced clarity of vision sets the stage for a more precise robotic surgery procedure. The surgeon uses master controls to guide the delicate actions of the robotic surgical instruments. One of the major advantages of the da Vinci surgery system is the tremendous range of motion of the robotic EndoWrist® instruments. They are designed with seven degrees of motion that mimic the motions of the human hand and wrist. Da Vinci robotic surgery essentially eliminates tremors and maximizes dexterity, precision and control.